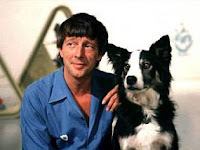 There were broadly two objectives for my pre-Jubilee week off work. I wanted to get the garden tidied up a bit, doing some of the time consuming but put-offable jobs (relaying slabs, moving a couple of shrubs, etc) that never seem to get attended to unless you've got two or three days to have a run at them. I also took a notion to go camping, partly because I hadn't used my tent in ages, and I don't want it to go the same way as the canoe. Surprisingly enough, the plans came together. 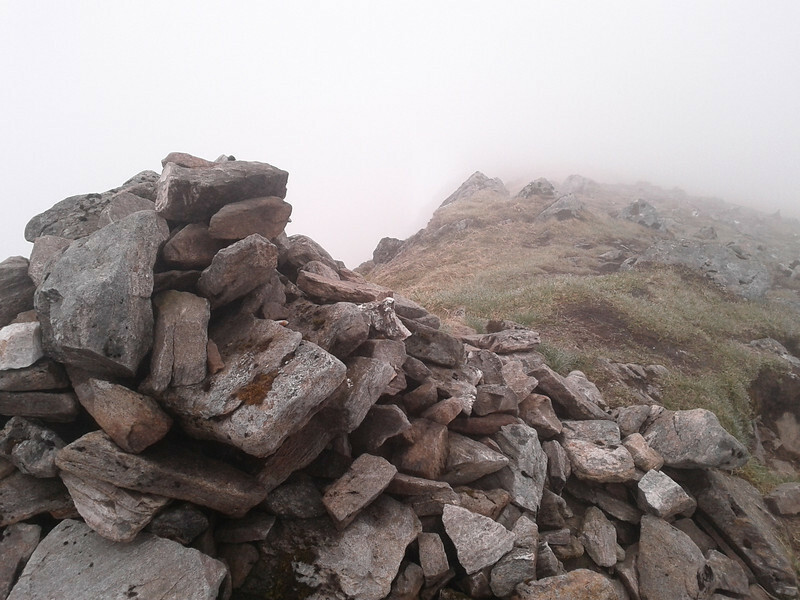 I'm not going to talk you through what I did with my begonias, but for anyone with a notion for a pleasant enough wild camp and Munro jaunt, the trip to Beinn Eibhinn and Aonach Beag from Glen Spean might hold some mild interest. The route I had in mind covers a total of about 19 miles (20 with my late navigational mistake factored in!) and I figured the best use of my time was to head up on the Monday evening, walk in for a couple of hours, camp and get an early start on the hill on Tuesday morning. The walk starts at the layby at the west end of Loch Laggan, a favourite spot, which I've used quite frequently in the past on various trips to the Ardverikie hills. 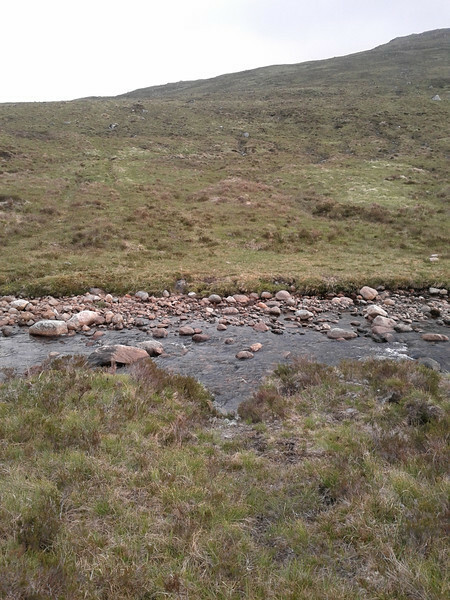 The difference this time is that instead of sticking with the left branch of the path leading on to Lochan na h-Earba, you hang a right and cross in front of the wee reservoir and follow the track towards the ruins at Lubvan. There's camping possibilities there, but I kept going for another 30 minutes or so before I started looking for a likely pitch. There weren't as many options as I'd hoped from studying the map. 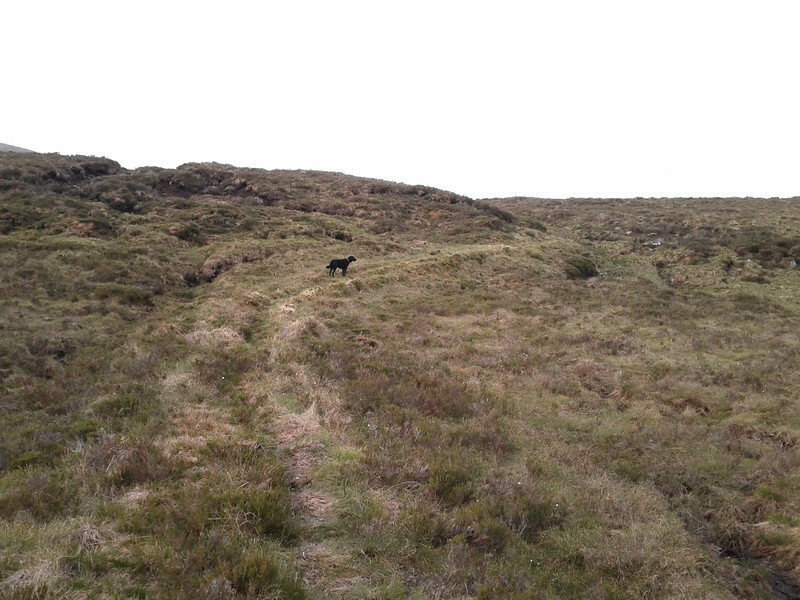 There's a lot of wet, boggy ground, and the terrain can't fairly be described as flat. A brief ascent to scope out the prospects further away from the burn didn't end terribly well when I discovered one nice open space ideal for sticking up a tent, but which was already occupied by a very large, very dead stag in a state of ongoing decomposition. A few hundred yards upwind however, things looked and smelled more promising, and the die was duly cast. 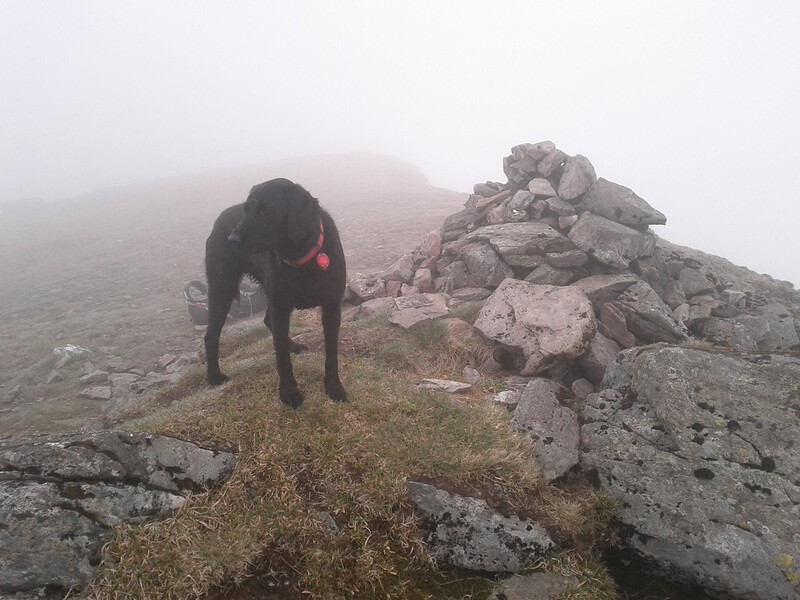 The Wee Black Dug wasn't entirely sure what was going on, and it was now well past her dinner time. 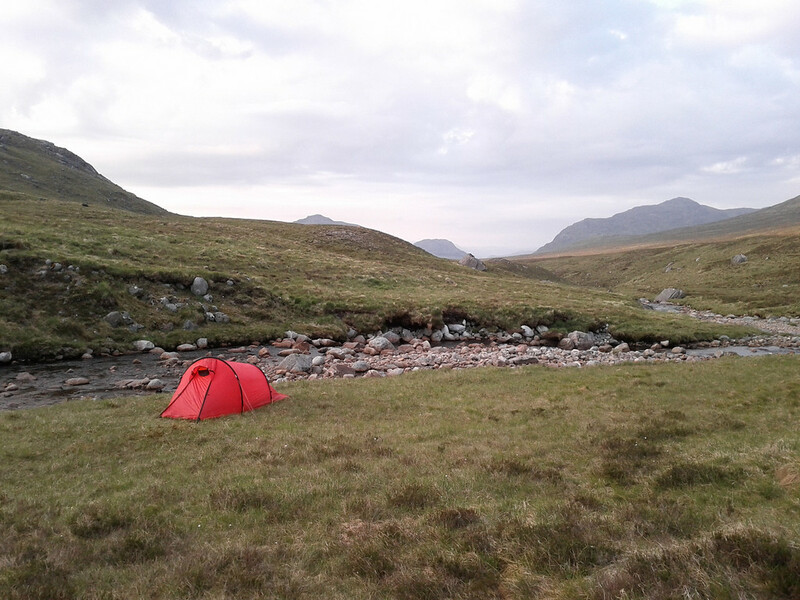 The weather at this point was fair, with enough of a breeze to keep the midges away, but not enough to cause any difficulties with the stove. I'd opted for the dehydrated stuff, so all I had to do was boil water which saves on pot scraping if nothing else. Jorja was also able to amuse herself trying to extract the last morsels from the longer-than-nose-deep foil pouch afterwards, so everyone was fed and happy. I went for a brief wander hillwards to get a feel for what tomorrow would bring. 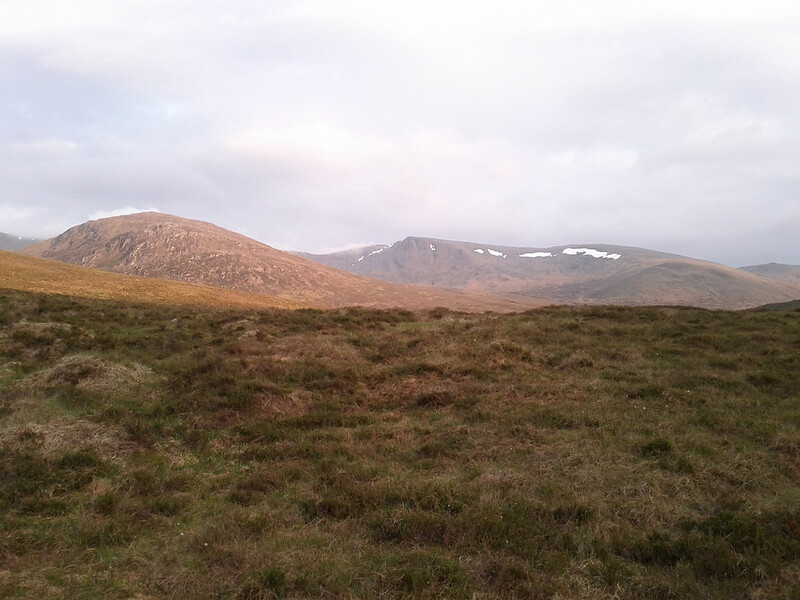 As it turned out, this was the best view I'd get of Beinn Eibhinn the whole trip, but even that was kind of short lived because the breeze elected to disappear completely at that point which constituted an irresistible invitation to the Ardverikie midges to come out and play. I was extremely glad that I'd stuck the stylish headnet into my rucksack at the last minute. Net or not though, conditions weren't conducive to staying outside the tent, so given it was after 10pm I thought it was justifiable to retire for the evening, with a view to an early start next day. Plus, I didn't have any alcohol with me. 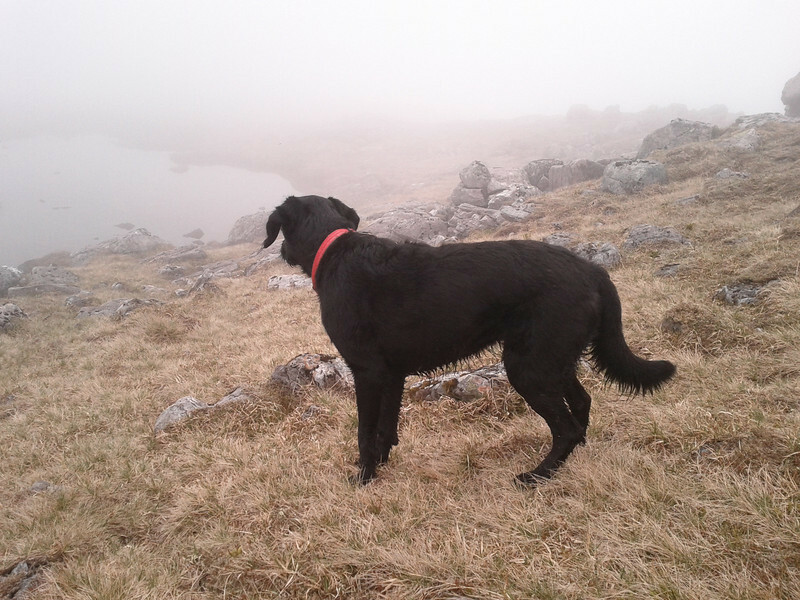 It was just as I had unzipped the tent that Jorja spotted a deer on the other side of the river and dived straight in, with a view to a chase. 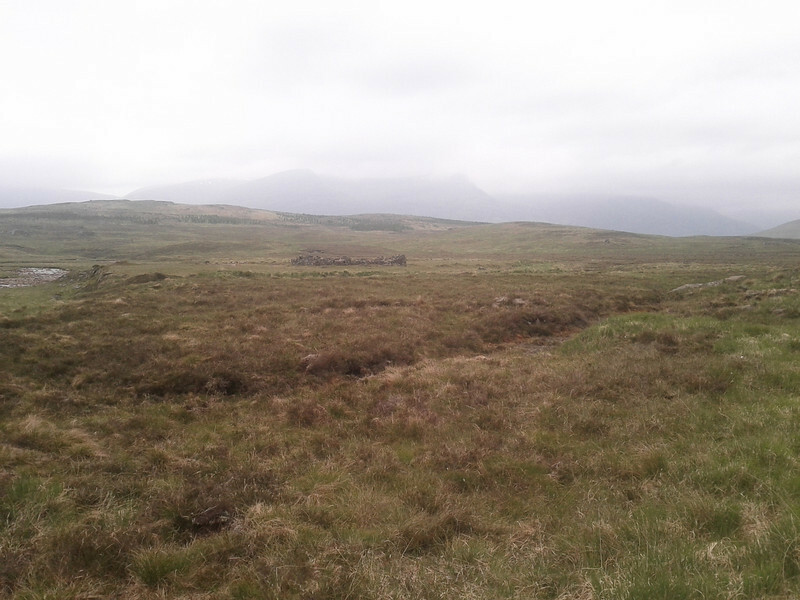 It's an odd use of time, standing in the middle of nowhere for half an hour, cursing the Highland midge, while waiting for a dug to dry off in the calm air of a Scottish summer. Still. 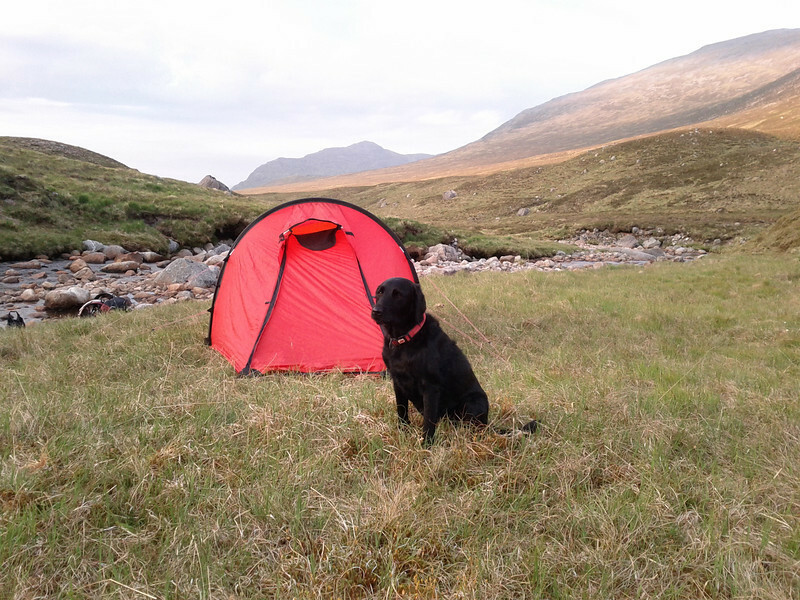 It was me that had wanted to go camping. 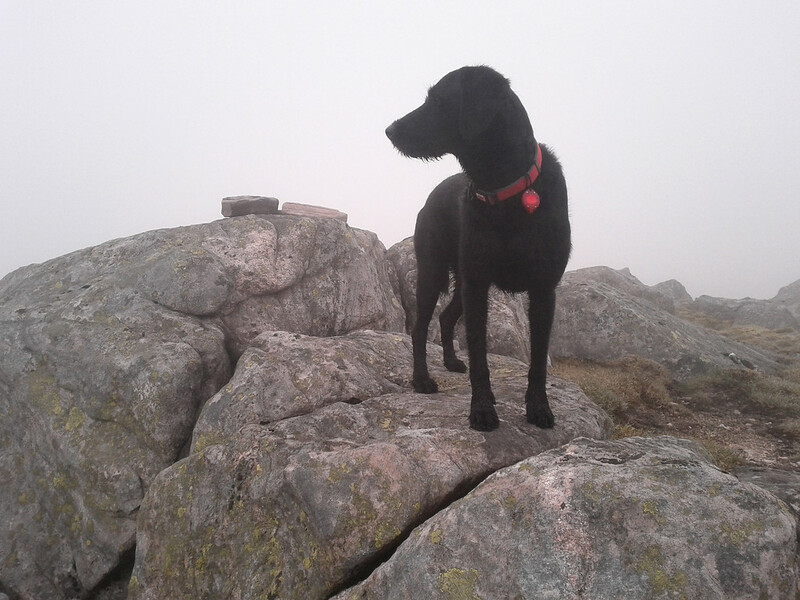 Slightly damp dog notwithstanding, I got a reasonable night's sleep. My big winter down bag is still lighter (as it should be, the cost of the bloody thing!) than my summer bag, so I had packed it, and just used it as a quilt for most of the night. I had hoped for clear skies, but it got progressively cloudy and the mist was largely an ever present feature of the next day. I got up about 7, had a rather pleasant brew at the riverside, fed the WBD, and was walking by half past. That's the thing that puts the camping in perspective - me & Andy are generally leaving Airdrie at about that time when we're going up hills. 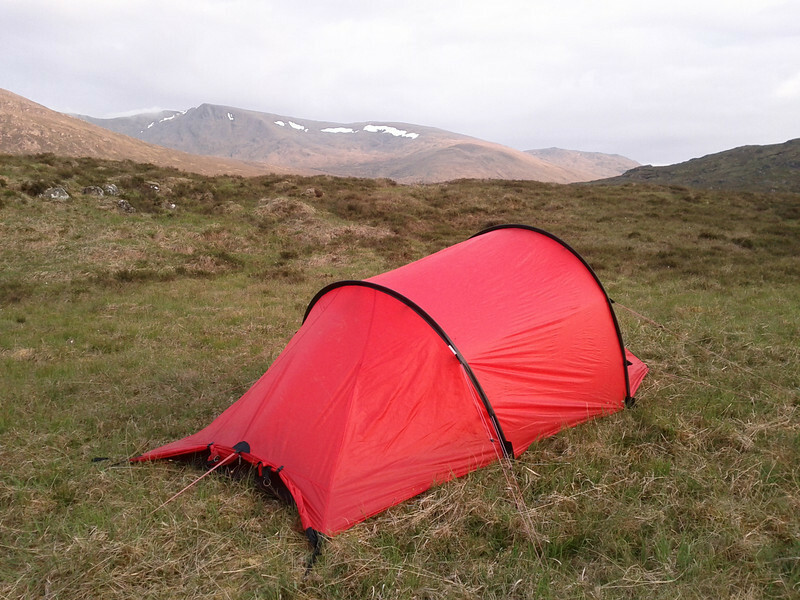 Big far-away Munro days will, I think, see the tent pressed into service a bit more regularly in future. The path had deteriorated and narrowed somewhat after Lubvan, but it was still sufficiently obvious. 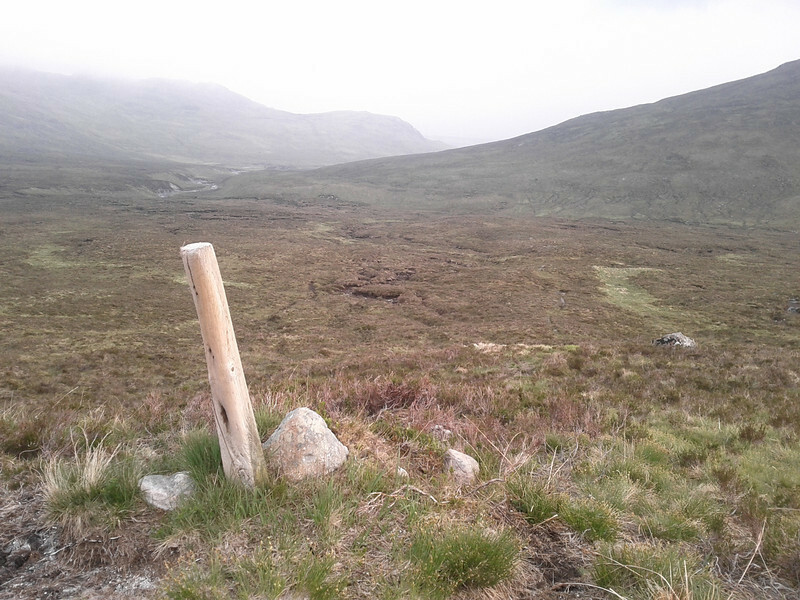 I suspect I was fortunate that I was there after a pretty prolonged dry spell, mind you, because it was still boggy enough in places to suggest it'd be a bit of a soggy trial in wet weather. 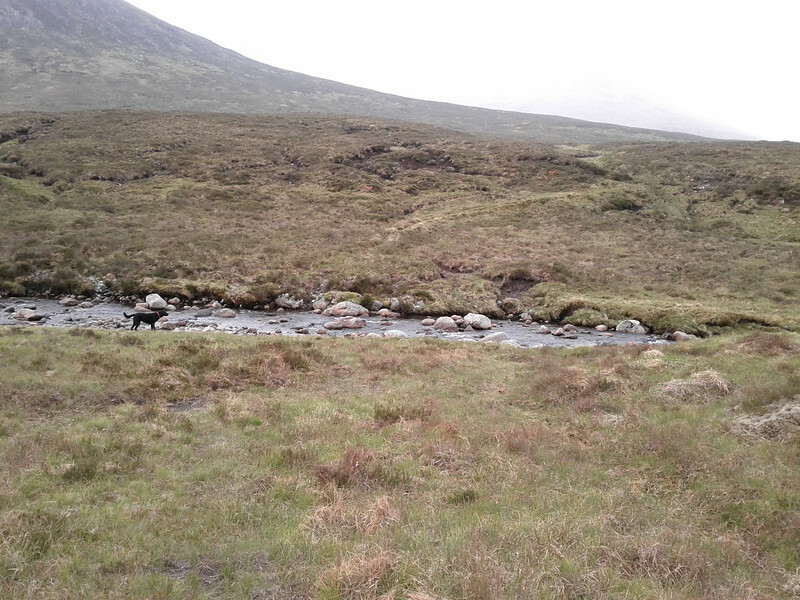 It leads you round the "west end" of Beinn a' Clachair, for the most part continuing to run alongside the burn (the Allt Cam on the map). The path is less obvious by the time it starts heading east behind Beinn a' Clachair, but the route requires you to leave it and cross the burn around here anyway, and there seem to be a few options for successful stepping stone location. ...eventually leading up to a fairly random marker post affair. After that, it was a case of trudging onwards, upwards and across the heather towards Coire a' Charra Mhoir, nestling below Beinn Eibhinn's summit ridge. 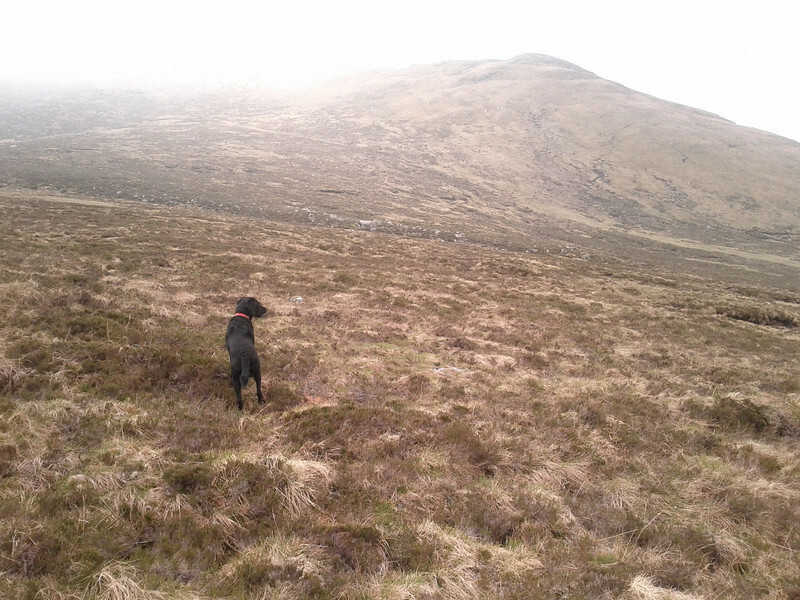 Once you're in there, pause for five minutes while your dug fruitlessly chases a herd of deer spotted in the distance, and then choose the line of least resistance up Sron an Fhuarain, which really forms the northmost edge of the ridge. It's enjoyably not too steep, as it were, but once you're at the skyline there's still a fair way to go. 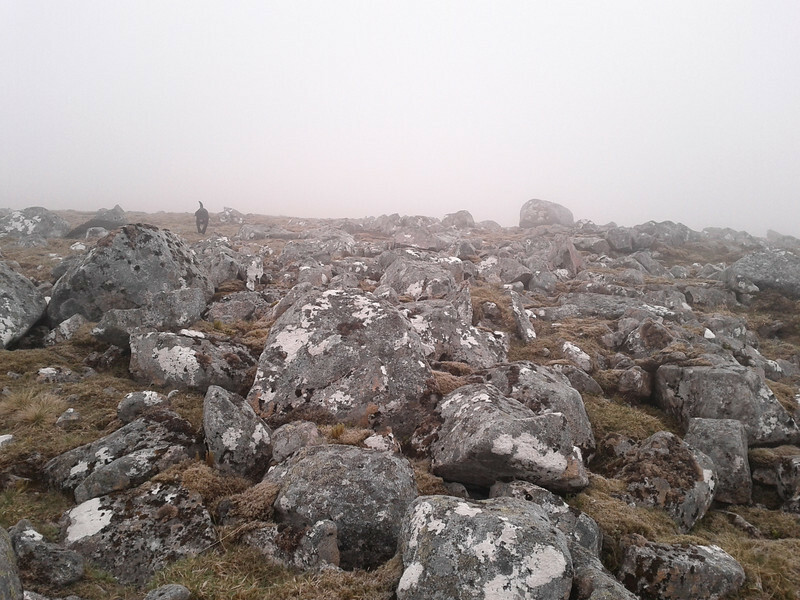 By this point the mist had settled in for the duration, and I was following my compass more than I had anticipated - it's a sufficiently wide, undulating and rocky ridge that it can be quite hard to tell whether you're following it in the appropriate upwards direction. Although flagging a bit, it didn't take too much longer to get to the real summit, which is perched on the edge of the long, sweeping ridge. It was just over three hours from tent to hilltop. I was, however, puggled. 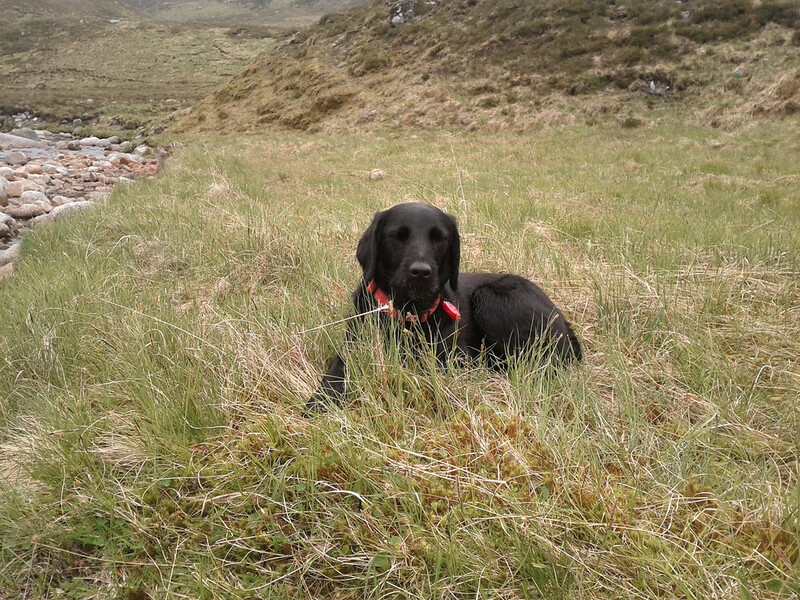 Maybe the traditional three hours travelling in a car before Munro bagging does me more good than I think. On the way up, I'd harboured thoughts of doing Aonach Beag and Geal-Charn as well, but the absence of any views of Ben Alder - which must be jolly impressive from this vantage point - and my general fatigue led to a reflective pause and a decision that if I could get two new hills out the trip, that'd be plenty. 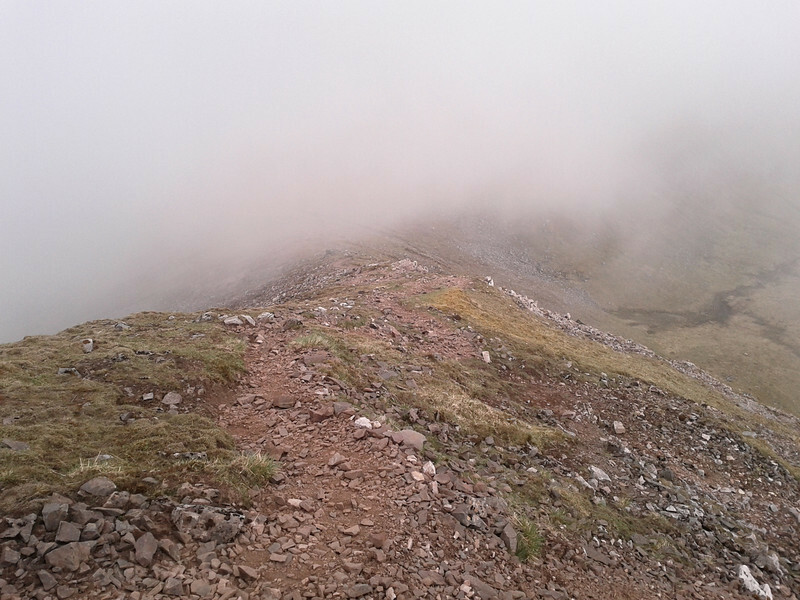 The onward route to Aonach Beag is clear enough - the fact that there seems to be no path up to the summit of Beinn Eibhinn from the Glen Spean side, but a huge clear track from the summit tends to underline the idea that most folk approach from the Ben Alder side. ...there's nothing to it - even for the weary footed. It's no more than 45 minutes from one summit to the other. 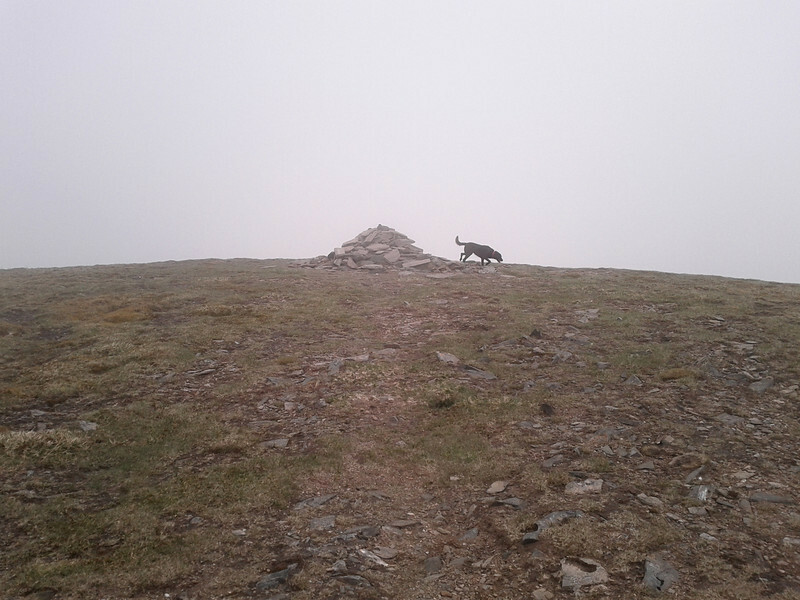 I reckon the addition of Geal-Charn would involve even less time and effort than that, but there was something psychologically offputting about heading further away from the car at that juncture. I kind of knew I was more tired than I felt, if that makes sense. 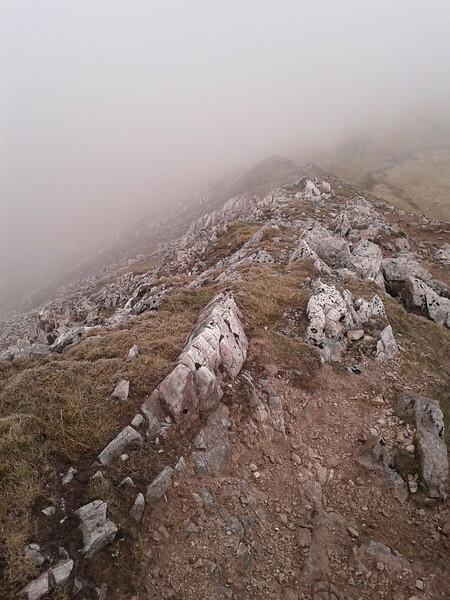 I'd got a boost from getting to the top of Aonach Beag more easily than I'd anticipated, but it wasn't enough to make me want to press on to the next hill. I was quite happy to head back on the originally-intended horseshoe route. 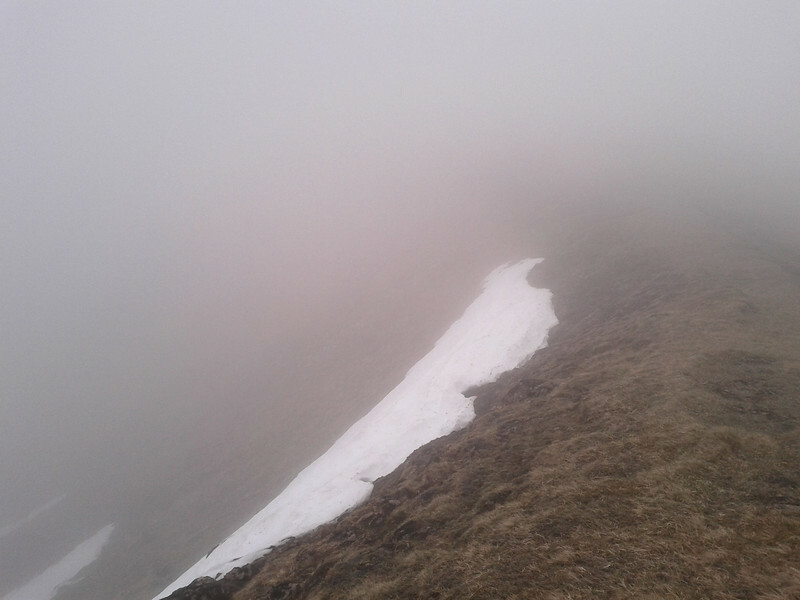 This takes the form of wandering down Aonach Beag's wide north west ridge, and thereafter deciding whether to bypass Meall Nathrach to the left or to the right. I chose the left, cunningly thinking that if I could pick up the cairny pole thing I'd passed on the way up, then it'd lead me on to the path and the previously-used stepping stones. Remember the navigational error I mentioned earlier? I was so intent on looking for the bloody pole that I blithely wandered about 15 minutes further north west than I should have before clocking that things had gone awry. 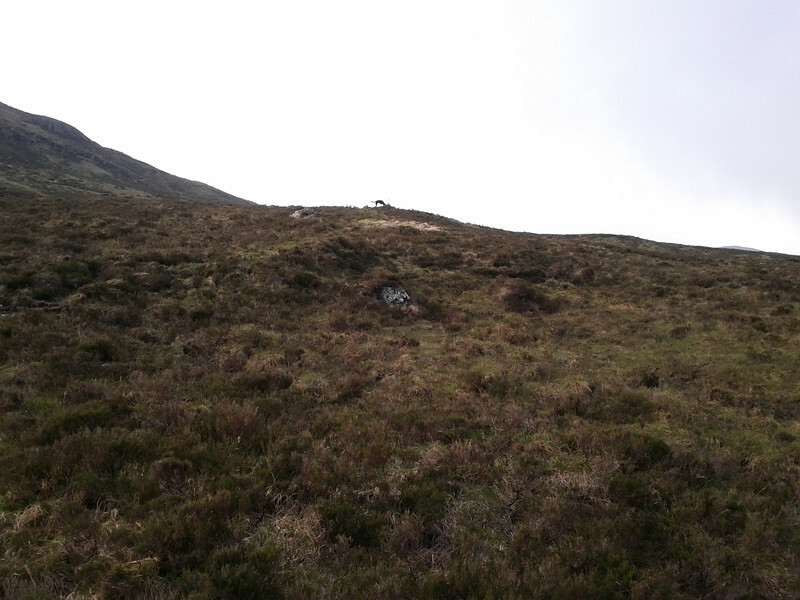 You'd think that the large peat hags that I hadn't encountered on the ascent, which were making the going very laborious might have alerted me earlier, eh? No matter. A regathering thoughts pause, a final sandwich and a general pulling of self together led to something approaching renewed vigour for the half hour stretch back to the tent. Which was thankfully still there. 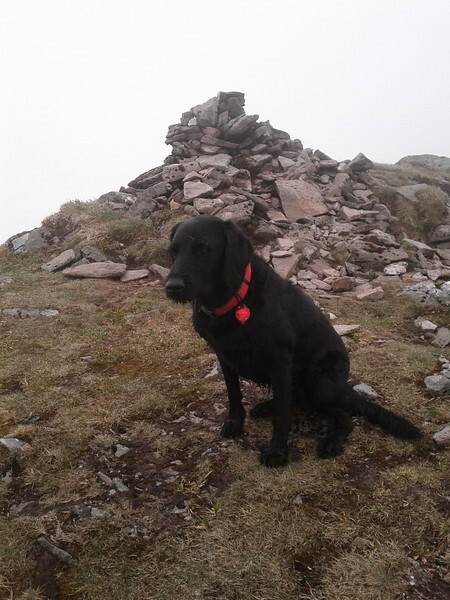 Even the hill machine that is the Wee Black Dug fancied a five minute breather. 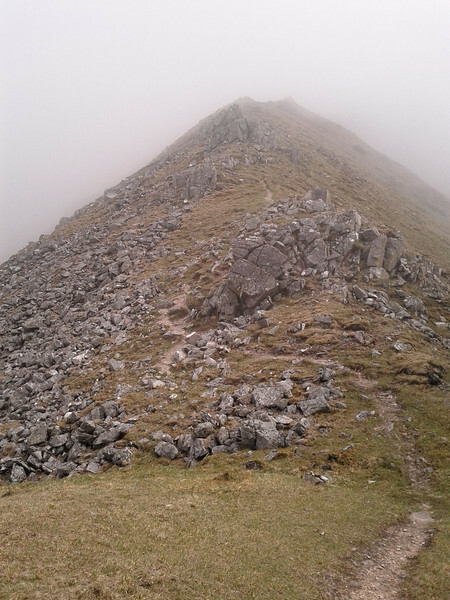 I will admit that packing everything back up and shouldering the laden rucksack again, in the full knowledge that it was about seven miles back to the car wasn't the most fun I'd had that day, but it's a good track, and I wasn't in any hurry. And it's all relative. The two hills had taken me about six hours from the tent. 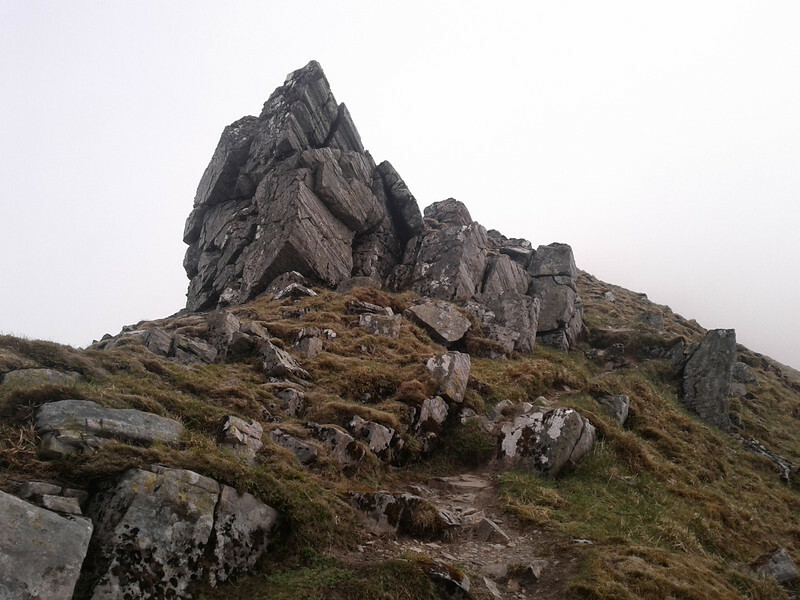 If you add another five hours for the walk in and walk out, and another six hours driving altogether, it'd have been a bit of a trial to do it as a daywalk - I wouldn't have swopped, certainly, even at that stage. I'm going to go camping again quite soon. It cheered me up. You have a tent???? You kept that a secret for a looooong time - fair play to you. A great report as always, and a nice choice of pitch. Yet another embarrassing outdoors secret. Cheered me up too reading that! Looks like a nice trip tho'. 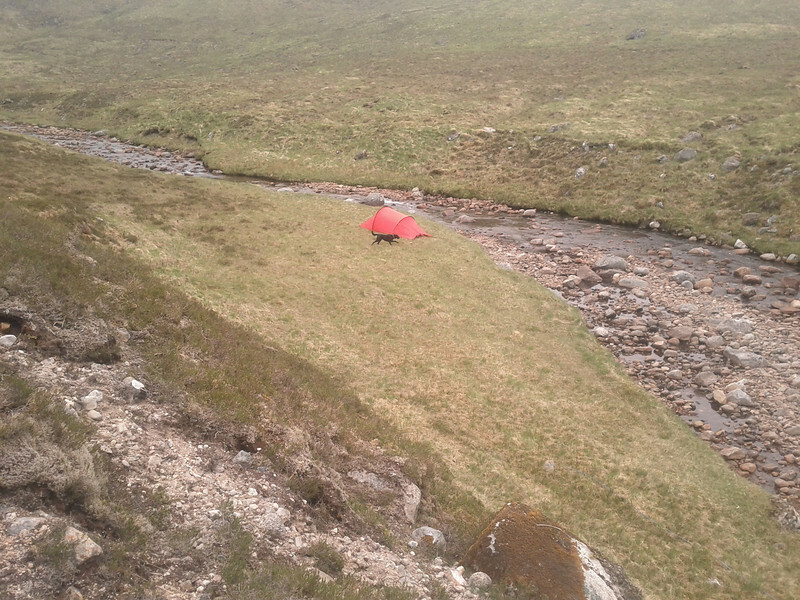 Incidentally, I'd pared the stuff that I needed for a single overnight wild camp right back to the bone. I'm thinking aboot weighing it all, to provide uncontrollable hilarity to the ultralight internet hikers. The necessary dug food adds a few kilos, in fairness.